Hey there, spooky friend! If you are looking for some creepy Halloween food to decorate your table, you have come to the right place! 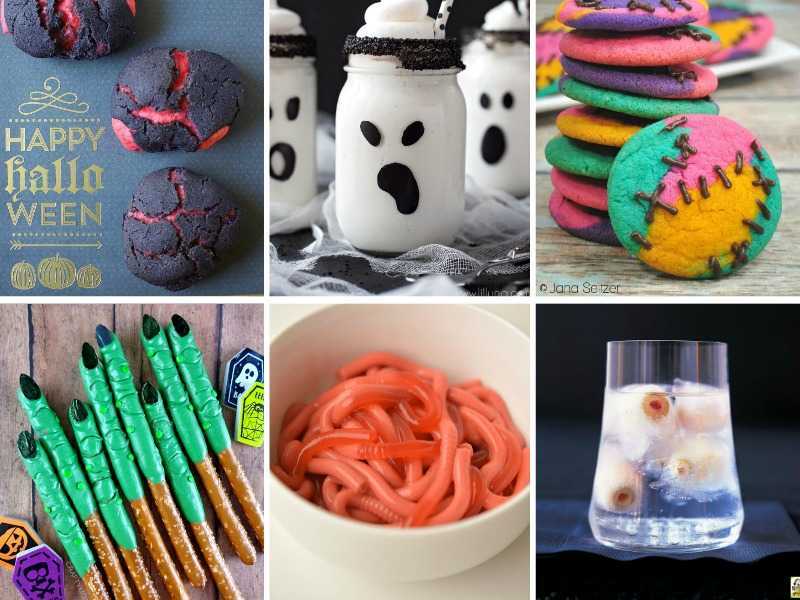 Here are 31 of creepiest, spookiest, most ghoulish Halloween food ideas for your Halloween party. Make no bones about it, these recipes are supernatural! 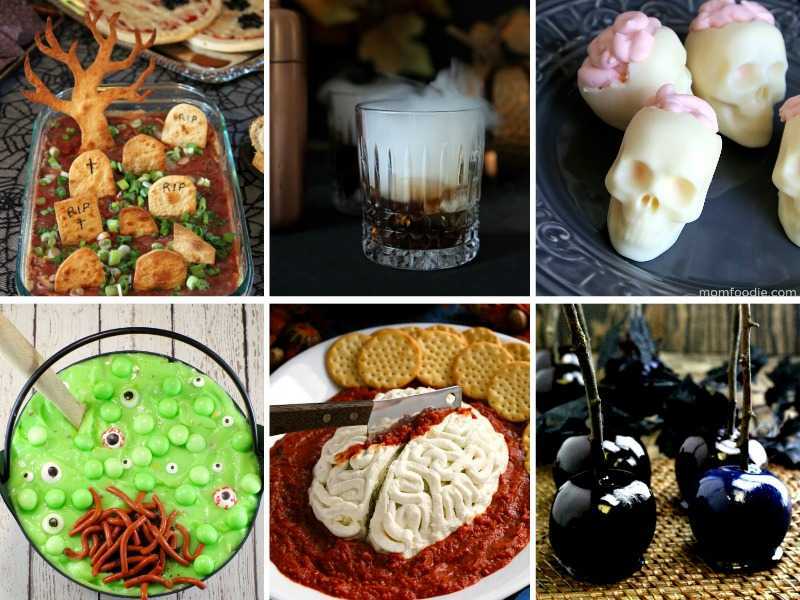 Here are the 31 best supernatural Halloween recipes for when you just can’t “human” anymore. 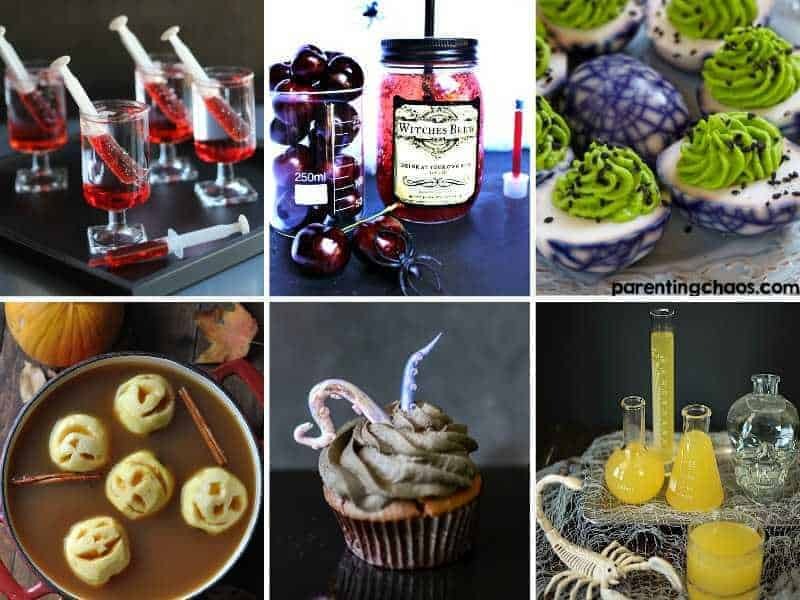 Ghostly drinks, bloody cupcakes, and even creepy eyeballs that stare at you while you eat them, these recipes have it all! These devilish little eyeballs from Momdot are devilishly good when served creepily up in a spoon alongside some black spaghetti! I’m not being a devil’s advocate when I say these look amazing! Do you like your brains shaken or stirred? Find out by making these Zombie Gore Guzzlers by Squirrels of a Feather. No alcohol, so feel free to share with the little zombies as well. Vegetarians will be delighted by this spooky pasta recipe from Vegetarian Mama! Shape an eerie monster face and then dig in! It’s just a bunch of hocus pocus…or is it? 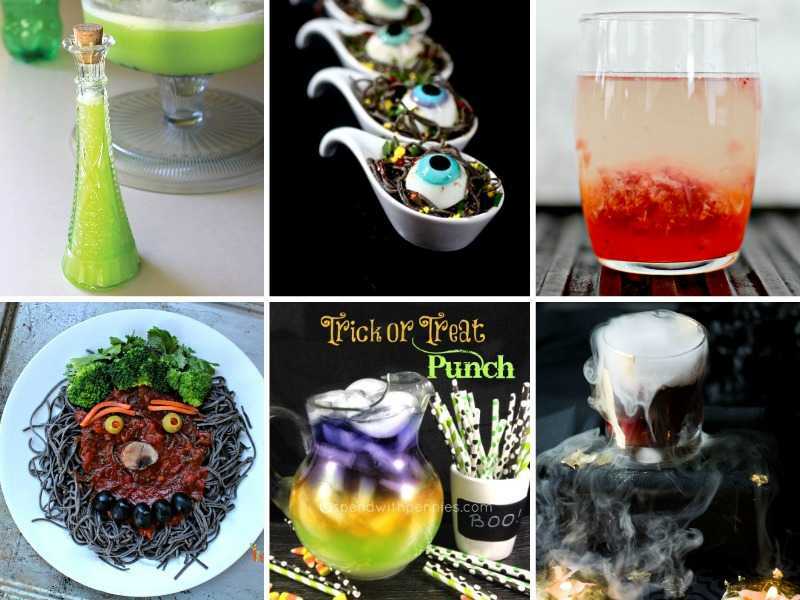 This colorful Halloween punch recipe from Spend with Pennies is giving me some seriously witchy vibes. It’s trick or treating MAGIC! That deep red color, that mist drifting sensuously down the sides of the glass…you will be begging for a bite — er, I mean sip — of this drink from Wanderspice. Another epic drink recipe from This Grandma is Fun, these bloody Shirley Temples are anything but innocent. It’s a gruesome delight to watch the “blood” spew out of the syringes into the drink. This non-alcoholic drink is fun for kids and adults alike. By the pricking of my thumbs, something wicked this way comes! It’s these witchy mason jars from Natural Beach Living that are clearly filled with dark magic. If loving rotten eggs is wrong, I don’t ever want to be right! You too will definitely love this ghastly green and purple deviled egg recipe from Parenting Chaos. Something is lurking deep beneath the surface of these cupcakes from Tikkido…pure deliciousness, that’s what! It’s The Great British Bake Off meets The Creature from the Black Lagoon! This poisonously yellow punch from Culinary Ginger probably won’t eat a hole in your stomach. Probably. Will you want a second glass? Definitely! You will have a devil of a time saying “no” to these brimstone bread loaves from Alison’s Wonderland Recipes. Just remember what they say about eating something from the underworld…I mean, look what happened to Persephone! These lil’ guys are trying so hard to be spooky. Just look at their little “BOO” faces! It’s a Halloween miracle that Lil Luna was able to create something adorably spooky. Iconic. Cult. Classic. I sense there’s something in these Sally sugar cookies from Whiskey + Sunshine that will make you simply fall in love! So THAT’S what happened to the Wicked Witch of the West! The pretzel witch wart fingers by Crafty Morning are a vivid green, tipped with almonds for fingernails. Totally awesome! These Jell-O worms from One Little Project are a fun, slurp-a-licious addition to any Halloween party. Dirt not included! This spooky taco dip from The Chickabug Blog is scary good. Those gravestones made out of tortilla chips are a cool touch! If you like White Russians, you will enjoy this ghostly cocktail, with its spectral mist drifting over the sides by Liquor.com. Delicate little white chocolate skulls filled with a pink brain mousse form. 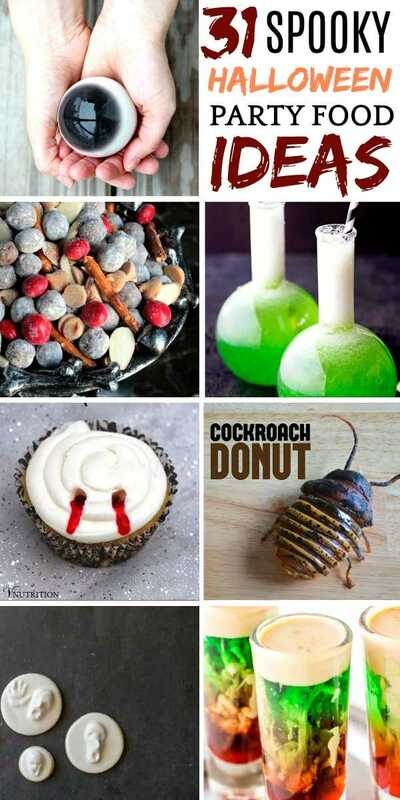 A definite creepy delight from Mom Foodie. I had NO IDEA what spumoni was until I saw this recipe! Per creator Food Meanderings, this dessert has “layers of cake, pistachio pudding, whipped cream, and cherry almond cream cheese, topped with mint eyeballs, bubbles and jello worms“. Get a cauldron and whip one up right now! You don’t have to be a zombie to enjoy this cheeseball from The Two Bite Club. Find out what that red stuff is at her blog! Fans of Disney’s Descendents will enjoy these poison apples from Wanna Bite, colored black and shiny. TAke a bite, dearie! Just like high school, except you can eat them! These giant edible eyeballs from Squirrels of a Feather are actually like a very stiff, rich coconut pudding! The ultimate creepy Halloween food that stares at you while you eat it! Get the recipe for this werewolf kibble at Big Bear’s Wife and feed that full moon hunger! Totally digging the Hocus Pocus reference Homemade Hooplah threw into her recipe for witches brew — make sure you check it out! These Vampire Bite cupcakes from VNutrition are bloody good. Take a bite out of them before they take a bite out of you! These cockroach donuts from Instructables contributor paperplateandplane have cream filling inside! Just imagine the look on your guest faces when they see these babies on your Halloween buffet! These creepy cookies from Tikkido look like your worst nightmare and taste like a dream! These gross shots from Homemade Hooplah have a 3D brain effect that will totally amaze your guests. The different layers of color are sure to amaze! Let me know YOUR favorite in the comment section below! This is an awesome roundup! I’ve pinned it to save it, thank you for including me! Who knew there were so many gross-looking recipes?! I think the cookies and cupcakes are my fave. Glad you like them, those pretzels were one of my favorites too! Hahaha thanks, Andrea…I mean, what vegan doesn’t want a vegan cow eyeball, right? 😉 Glad you liked them all! Hugs back. OH MY GOODNESS! So many options. Some of these look pretty easy too. Thanks for all the ideas. 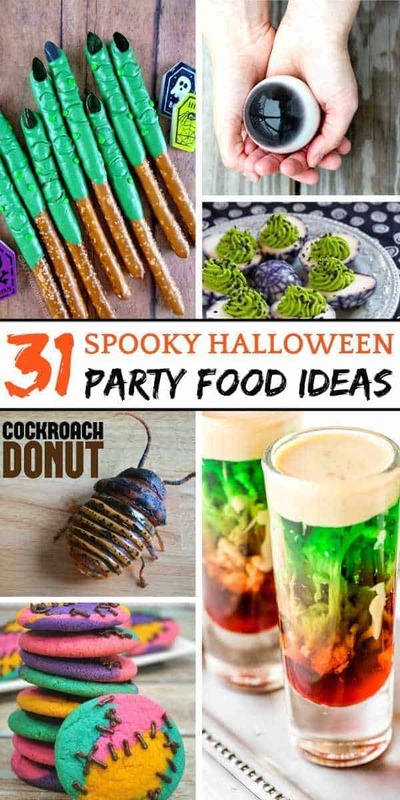 Great ideas for a fun Halloween! !